The hype is real! Nike and Virgil Abloh spoil all Nike fans with a brand new Limited Edition Mercurial football boot. Enjoy the gorgeous Nike Mercurial Vapor 360 x Virgil Abloh right here. Today, Nike has launched a brand new colourway, designed by the hyped OFF-WHITE designer, Virgil Abloh, who recently took over as men's wear designer at Louis Vuitton as well. This is not the first time, Nike does a collab with Abloh. Last year, the designer got the streetwear world hyped with his collection called 'The Ten'. This time around, Abloh has shown some love for the Mercurial Vapor: Meet the Nike Mercurial Vapor 360 x Virgil Abloh! 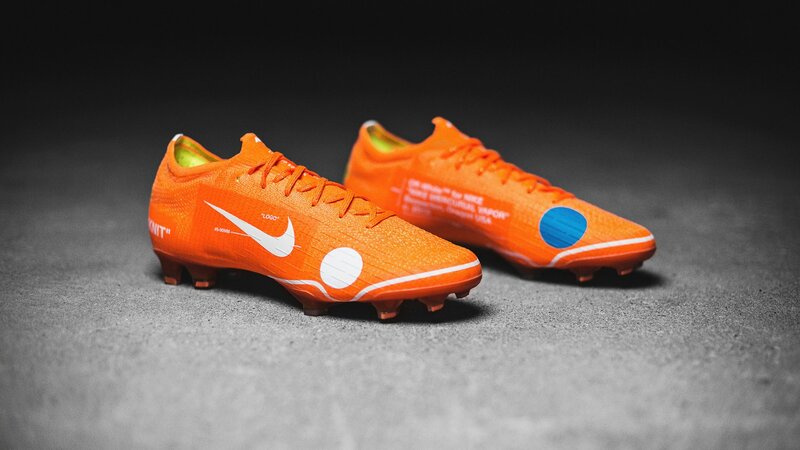 Similar in design to the OFF-WHITE Mercurial VaporMax first previewed by Virgil Abloh at the Mercurial event in London back in February, the Mercurial Vapor 360 x Virgil Abloh feature a vibrant orange upper with OFF-WHITE branding, text and circular graphics throughout. OFF-WHITE's signature industrial-style labelling features in the form of “KNIT” and "LOGO" on the lateral side of each, as well as Nike's own "LIMITED EDITION" labelling featuring beneath the tongue. And come on guys, this boot is absolute fire - we can't wait to see it on the pitch! And you know what? Nike and Abloh has teamed up with French superstar Kylian Mbappé who's going to wear the boot in a Superfly version. Nike is only going to sell the Mercurial Vapor 360 x Virgil Abloh in a Vapor version, so the Superfly Mbappé will be playing in is the only one out there! Tech wise, fit is still the foundation of fast on the Nike Mercurial Vapor 360 x Virgil Abloh. No matter how innovative a pair of football boots may be, if the fit isn’t right, if the foot slides even 1mm inside the boot, speed can be compromised. This is no problem in the Mercurial 360s because of its game-changing 360 construction made possible through a new advancement in Nike Flyknit technology. This new innovation simply hugs the foot and eliminates the gaps between the foot and the soleplate. Like on the other Mercurial 360 boots, traction is provided by precisely placed studs in the forefoot and heel. Less like a hoof, more like a claw, Nike's inspiration comes from agile cheetahs and focuses on traction at speed. Finally, the Mercurial 360 provides a softer touch to the ball, though it can still battle the elements. This is due to the Nike All Conditions Control (ACC). Previously, ACC was applied on top of the finished Flyknit product, creating a thin layer. Now, ACC is embedded into the yarns prior to knitting, eliminating the additional skin without compromising the performance benefit. Want your own pair of the Nike Mercurial 360? Then take our quiz and sign up!